Corporate Partner IBM Gain expertise in related IBM technologies & solutions with exclusive training and certification from IBM. 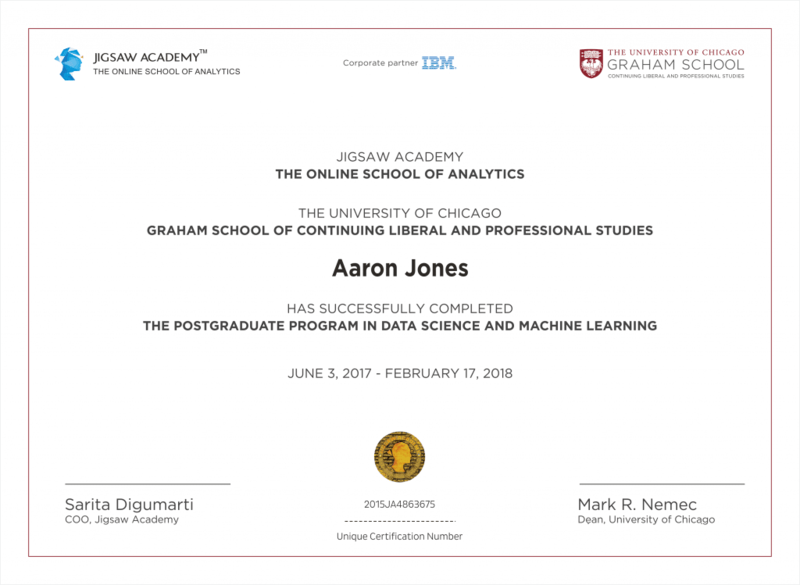 Enrol for the most specialized data science program and machine learning program in India, the Postgraduate Program in Data Science and Machine Learning (PGPDM), by the University of Chicago’s Graham School, the professional division of one of the top-ranked universities in the US; IBM, the global technology leader; and Jigsaw Academy, India’s top online school for analytics. The program is a blend of data science, deep learning, business analytics, visualization and project management education with the application of advanced analytics models for artificial intelligence, deep learning and cognitive computing. Designed to give students a comprehensive analytics education with a combination of online and in-person sessions, projects and seminars by industry leaders and hands-on learning in the Jigsaw Lab, PGPDM has already made a significant impact, being ranked #2 in the ‘Top 10 Executive Data Sciences Courses in India’ by Analytics India Magazine for 2017 & 2018. If you already have some experience in technology and are interested in building a career in the futuristic areas of Machine Learning, Deep Learning and AI, the PGPDM can equip you with all the skills and tools you need. The program comprises of 450+ hours of training via online and instructor-led classes and in-person classroom sessions held on weekends, as well as video lectures in Bangalore. Would you like to know more? Download the PGPDM Brochure. Since the University of Chicago’s founding in 1890, the Graham School of Continuing Liberal and Professional Studies has served as the center of innovative lifelong learning, extending the University’s academic values to a broader audience. They offer professional development with practical application, powered by the University of Chicago’s mission as an intellectual destination leading new ways of thinking. The University of Chicago is consistently ranked within the top 10 universities to study at globally. The PGPDM curriculum covers best in-class modelling and data analytics techniques, through a combination of lectures, a capstone project and assignments. The course enhances analytical skills to drive impactful insights from data, using tools, such as R, Python, Tableau, Big Data, Hadoop, MapReduce, Spark, SparkMLlib, IBM Watson and Tensor Flow. PGPDM also provides excellent preparation for graduate-level study. Learn more about the University of Chicago Graham School’s M.Sc in Analytics program. The PGPDM has a rigorous curriculum which culminates in a real-time project featuring actual business problems which students will be expected to solve applying the analytics knowledge gained. The capstone project is a program requirement that’s designed to build this competency. Student teams will identify a company with both a business problem and the resources needed to carry out the research process, and work with analytics industry research partners across levels and functions. Students will also additionally have access to proprietary and rare data from companies and work in a secure online lab to prepare the analysis report. Our faculty are an active community of acclaimed scholars, industry experts and professionals on the cutting-edge of high technology. Limited scholarships of up to INR 20,000 are available for the PGPDM from university of Chicago Graham School and Jigsaw Academy. If you are interested in availing the scholarship, you will have to indicate the same during the application process. You will have to additionally take an aptitude test prior to the telephone interview - the results of which will decide your eligibility for the scholarship. You will be informed as to whether you have qualified for the scholarship prior to start of the program. To avail the scholarship, apply for the program here. Next, share an SOP (statement of purpose) on why you intend to take up the course and why you deserve scholarship. 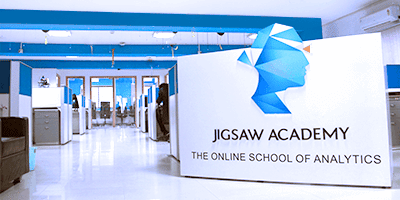 Lastly, share the following supporting documents at: pgpdm@jigsawacademy.com. To qualify for the opportunity, applicants will need to have applied for the program and indicated their interest in the scholarship through email. They will be assessed on the basis of a combination of their past academic performances, current professional status, and the interview. They will be intimated on whether their scholarship request has been accepted or not before the commencement of the program. Since the scholarships available are on a merit basis and are limited, applicants are urged to apply as soon as possible. McKinsey Global Institute predicts that by 2018 there will be about 1.5 million more jobs than skilled data scientists available to fill those jobs. This bodes well for anyone thinking of moving into data science, or augmenting their current skill set with data science. PGPDM graduates will be primed to pursue a wide variety of prestigious and extremely well-rewarded positions in the following domains. Discover your post graduate career destination. Download the Jigsaw Academy Salary Report 2017-2018. PGPDM offers guaranteed internships to all eligible candidates during the term if the program. These are with some of the biggest companies and exciting new startups across retail, technology, banking & finance and other domains. The program offers a robust recruitment program combined with high-level networking opportunities for our students to engage with industry experts, through guest seminar series, capstone projects and guest lecturers. In addition to the PGPDM career workshops and resources, students also have access to resume assistance and interview prep skills with industry professionals. To start the application process, students will need to submit their application online along with the payment of an application fee. A telephone interview will follow once an application has been deemed successful. All candidates will be evaluated on an individual basis and only selected candidates will be emailed the offer letter. Pre-approved loans available, refer below for more details on our ‘Enrol now, pay later’ offer. Note: All students must attend the in-person classes at the respective location. If admitted, students will be required to attend in-person classes during the weekends (Saturdays and Sundays) seven times, in the 10 month period. This is a non-residential program. PGPDM lets me build a network with elite technology professionals. PGPDM is the perfect program for a working professional like me. This course is perfect for mid-level professionals who want to develop different functions centered around their current roles. I compared a lot of PG programs, and compared them with courses from the IITs and IIITs, and I felt this was much better! 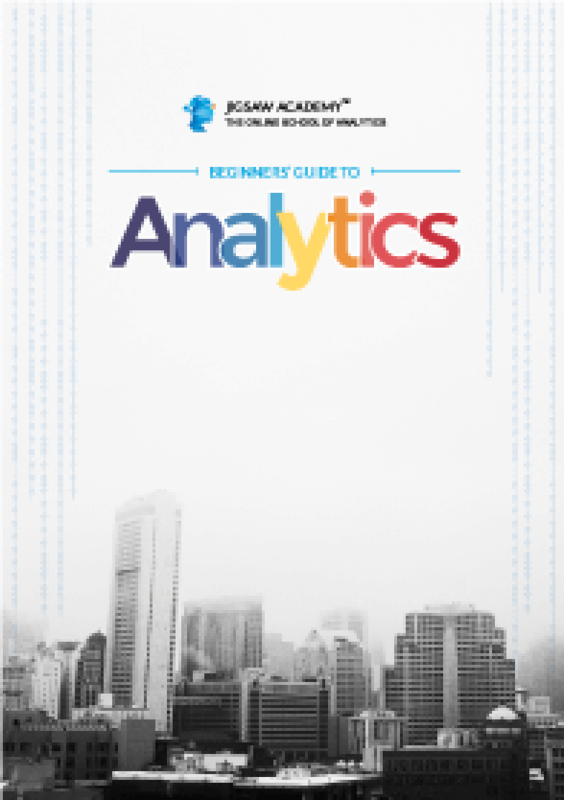 The faculty are experienced in implementing analytics in real life! For a mid-career profession, domain skills, ability to understand the business perspective and logical ability are the biggest factors. The complexity of the business is impacting hiring as well, we are looking for specific techniques, domains and communication. The PGPDM has an in-depth curriculum which I could not find elsewhere. This is the only course which teaches the cutting-edge techniques of advanced Machine Learning, Artificial Intelligence, Big Data and Deep Learning. What is the eligibility for the PGPDM? a. Completed (or final year student of) Bachelor’s degree program ( BE/ BTech/ BCA/ BPharm, BSc, BCom, BA) from a recognised Institute/ University. c. Min 50% marks or equivalent in the qualifying examination. b. Master’’s degree holders will be eligible based on the above academic requirements. If you are admitted, you will be required to attend in-person classes during the weekends (Saturdays and Sundays) seven times in the 10 month period. This is a non-residential program. Can I visit to know more about the program and faculty? Site visits are organized regularly. You are invited to come and take a tour of the campus, interact with the Director or Faculty and have all your queries resolved. Please contact the PGPDM counselors for details. You will have to fill the online application form and pay the application fees. The application will then be evaluated by the selection committee. If your application is selected, you will attend a telephonic interview. Subsequent details regarding the selection procedure will be shared with selected candidates after application submission. Is there a special loan offer for students? The loan disbursal and offer are from our loan partners and are dependent on your credit rating and details. The program is spread over ten months. If I choose to withdraw my application for admission, will I be eligible for a fee refund? The application fees and payments are non-refundable. In case of extenuating circumstances, a transfer to the next batch is possible. This transfer will be approved in genuine cases only. Will I get placement support after I complete the program? Yes, you will get placement assistance when you complete the program, as per the program’s placement policy. Please contact the PGPDM counselors for details. What are the details of the guaranteed internships for PGPDM? As part of the PGPDM, we offer 100% guaranteed internships to all the certified students after the course is over. The CVs of the students are shared with our corporate partners who offer a 3 to 6 months internship. How does the internship process work? Companies offering internships are identified in the last few months of the course. The companies offering internships will vary. Participants may not have the option to choose the internship company or location. This will be based on your CV’s qualification by the company offering the internship. Stipend amount varies by company. The monthly stipend for the internship typically ranges from Rs.10,000 to Rs.30,000. Some may offer higher or lower stipends as well. Can I choose the company and/or location? The location may be in any city as chosen by the company. Most of the internships are in Bangalore, Delhi NCR, Mumbai, Pune, Hyderabad, and Chennai. While we guarantee an internship, the company, duration, location and stipend amount may vary. While we will factor in your preference we may not always be able to accommodate your requests as the final say lies with the company. Yes, we have tie-ups with established financial institutions in case students wish to opt for an education loan to finance the program fees. What is unique about the curriculum in PGPDM? c. The Program provides the candidates with hands-on exposure to tools such as R, and Tableau. d. The blended delivery model (in-person and online) of the program makes it convenient for working professionals to attend classroom sessions without having to quit their jobs and also, pace their learning through online sessions. Are there any industry partnerships? Yes, we will have knowledge and corporate partners who will play an active role in the exposition of the curriculum, learning interventions and in placements. How will PGPDM help me progress in my career? The PGPDM equips you with the most in-demand high end technical skills in Data Science and Machine Learning as well as Artificial Intelligence and Deep learning. 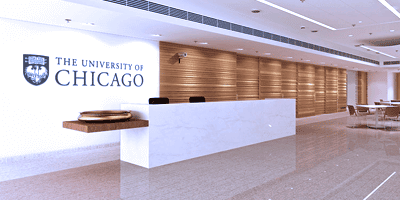 The global acclaim of the University of Chicago Graham School, the technical expertise of IBM and the training credentials of Jigsaw Academy will make you a high-demand priority resource for any corporate to hire. Yes, you need to bring your own laptop. The technology requirement shall be shared at the time of enrolment. The certificate is awarded jointly by the University of Chicago Graham School, IBM and Jigsaw Academy. Would UChicago instructors be teaching this course? 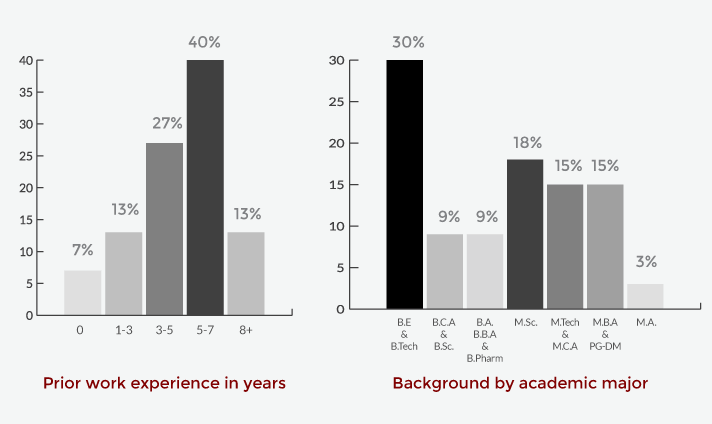 Yes, UChicago faculty are an integral part of the curriculum delivery process. Would I have to spend extra on books, online learning material or license fees? All the requisite learning materials will be provided online through the Learning Management System. You are free to purchase any reference books or material as may be recommended by the faculty. We believe that learning should continue and hence, all the learning material i.e. lectures and reading content would be available to you for 12 months after the course ends (in addition to the course duration which is 10-11 months). We accept corporate sponsorships and can assist you with the process. Please contact the PGPDM counselors for details. What types of projects do students work on? The students work on live projects involving real-life data used by companies. The projects test the students in analytics, Big Data and techniques including machine learning, predictive analytics and neural networks. TYPE 1 – The company will give the problem definition and data. The students will present their findings. TYPE 2 – The company gives the data and the students perform data cleaning and data manipulation. The students and the company then work together to discuss what needs to be achieved from the data. The student groups are assisted by a faculty mentor and a point of contact in the company who provides business perspective and the vision of what is needed out of the project. The faculty provides technical assistance and guidance which is suggestive rather than perspective. The students do the heavy lifting and experience the challenges of real life projects. How does a Capstone Project work? Can you share more details about the students who join PGPDM? The PGPDM has a diverse group of talented professionals. Together they foster a creative, competitive, yet collaborative environment. Our students’ academic backgrounds range from engineering and computer sciences to economics and business. Some are freshers, while others bring over 6 years of work experience in fields such as analytics, information technology, finance, academia, and consulting. What are the criteria for the certification? You will be assessed at regular intervals and your final grades reflect all the assessments and not just a single final exam. Each course module will include the grading for the assignments in the module. Your attendance and assessment criteria need to meet the base attendance and assessment criteria to graduate with the PGPDM certification. How can PGPDM help or add value in pursuing any masters course abroad? The PGPDM provides excellent preparation for graduate-level study. It will cover all the topics and coursework that you will be expected to have a foundation in when joining any Masters program – whether technical, management or data-related. Attend our upcoming events where PGPDM staff discuss program curricula, review application and admission requirements, and answer your questions. Our team is happy to meet with you to discuss the PGPDM certification and its suitability based on your career profile. Use the link below to schedule a one-on-one appointment with an enrolment counselor. If you cannot find a time that works for you, we encourage you to contact us at pgpdm@jigsawacademy.com and we can find a time to meet. For any queries regarding admissions, or to establish industry or academia relationships, or additional assistance, reach out to us at pgpdm@jigsawacademy or +91 9019217000. To apply for the PGPDM program, you will need to provide the following necessary details & documents (in digital format for upload). Please ensure you have all the documents before you attempt to fill in the application form. If you need help with your application, or do not have all the essential documents ready in an uploadable format, you can request a callback from us to guide you through the process. Otherwise please click 'Next' to proceed with your application. Are you interested in a scholarship? All scholarship candidates will be required to undergo additional evaluation and testing. You will be charged a non-refundable application fee of INR 499 upon submitting your application. You can pay by using credit/debit card or by using netbanking. Would you like to receive text messages for PGPDM? You will receive occasional text messages regarding events and application status, if applicable.